This article is about the narrative. For the film, see 2001: A Space Odyssey (film). 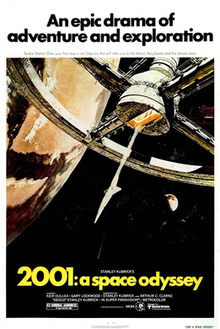 For the novel, see 2001: A Space Odyssey (novel). For other uses, see 2001: A Space Odyssey (disambiguation). 2001: A Space Odyssey is the 1968 science fiction novel written by Arthur C. Clarke and the 1968 film directed by Stanley Kubrick. It is a part of Clarke's Space Odyssey series. Both the novel and the film are partially based on Clarke's 1948 short story "The Sentinel", an entry in a BBC short story competition, and "Encounter in the Dawn", published in 1953 in the magazine Amazing Stories. After deciding on Clarke's 1948 short story "The Sentinel" as the starting point, and with the themes of man's relationship with the universe in mind, Clarke sold Kubrick five more of his stories to use as background materials for the film. These included "Breaking Strain", "Out of the Cradle, Endlessly Orbiting...", "Who's There? ", "Into the Comet", and "Before Eden". Additionally, important elements from two more Clarke stories, "Encounter in the Dawn" and (to a somewhat lesser extent) "Rescue Party", made their way into the finished project. One other element (crossing vacuum without an intact pressure suit) is from the short story "Take a Deep Breath". Toward the end of the sequence where the HAL 9000 computer is lobotomized, it begins to play the 1892 song "Daisy Bell (Bicycle Built for Two)" by Harry Dacre, which Clarke had seen a demonstration of computer synthesis on an IBM 704 at Bell Labs in 1961. The rendition is gradually slowed down to a progressively lower sample rate, which then creates a strikingly electronic, distorted, basso profundo. The Space Odyssey series is a science fiction series of four novels, primarily written by the science-fiction writer Arthur C. Clarke, and two films, released from 1968 to 1997. Stanley Kubrick directed the first film, 2001: A Space Odyssey (1968). He also co-authored the treatment and screenplay with Clarke, based on the seed idea in an earlier short story by Clarke (which bears little relation to the film other than the idea of an alien civilisation's having left something to alert them to mankind's attaining the ability to space travel). 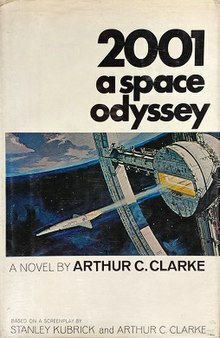 Clarke's novel 2001: A Space Odyssey was published in 1968. Kubrick had no involvement in any of the later projects. ^ Hughes, David (2000). The Complete Kubrick. Random House. p. 94. ISBN 9781448133215. Retrieved 12 December 2017. ^ Arthur C. Clarke (1972). The Lost Worlds of 2001. Signet.